This is the first course I think about in Scotland, partly for family history reasons, partly as it is the first club I joined. We used to go to East Lothian for family holidays and when we went to North Berwick, I always wondered if I might get to play the course. Well, here we are and I am a very proud member since 2010. The golf course occupies a wonderful position adjacent to some beautiful beaches and has several famous holes including the 13th Pit, and 15th Reddan. Lovely view back from the 11th tee. North Berwick itself is a picturesque seaside village about 45 minutes drive from the airport. Edinburgh is easy to get to via a 30 minute train ride. The town is a convenient base to access all the 20 plus courses in the region, all within less than 15 miles distance, and amazing golfing location. You will also find the weather a bit different from the rest of Scotland. I am convinced there's some kind of micro climate here as I have been playing in shorts and golf shirts watching the rain hit Edinburgh just along the coast. Looking down the 18th to the Clubhouse. A view of the harbor part of town with the Bass Rock in the background, taken from the first tee at NBGC. Magnificent beaches all along the golf course. You can walk for miles. Thats the famous Bass Rock in the back ground. This is the Fidra Island and Lighthouse. The island's name is believed to be Old Norse in origin, referring to the large number of bird feathers found there. Like the nearby Bass Rock, it has a substantial seabird population, and is now an RSPB reserve. Robert Louis Stevenson often visited the beaches at the area known today as Yellowcraig and it is said that he based his map of Treasure Island on the shape of Fidra. The Clubhouse is lovely. It has been modernized and updated in a number of aspects but still retains the feel of a comfortable place with a nice relaxed atmosphere. The staff are friendly and the upstairs lounge a good place for a coffee before play and a beer and lunch after. The old men's locker room is used occasionally as a dining room. I have hosted a couple of events there including a dinner after my daughter's wedding, and it was just a wonderful experience. You can hire the place and I recommend you do if you have anywhere between 12-36 in your party. It's just a lovely place and the cost is extremely moderate. I took this pic (on my iPhone) in September 2015 when we had a celebration supper at the Club with some family and friends after my daughter Louise's wedding. Us in 2010 with the Eighteenth flag in the background. The pro-shop is welcoming and run by Martyn Huish. It is a unique facility as it is located almost in a bunker under the first teeing area. The range of items for sale is not bad, and the North Berwick logo is amongst the more attractive club logos out there. The starter's box has a small putting area, but your only warm up will be hitting seven irons into netting. The course plays straight out to the 8th hole then starts to turn back at 10. The perils of missing the 18th fairway right. Ed VV in 2010. He did not make par. Turner Bailey, Eric Sappenfield, Kevin Keady, Clarke Bailey, Timmy Dolan, mw, Peter Dolan, Chris Wolters. My cousin Pat's husband Alan Phillips playing from the beach at number 2 in 2010. I own this house near North Berwick in Gullane. Please take a look. The North Berwick Golf Club. I would like to apply for Membership of North Berwick Golf Club. I was fortunate enough to play the course recently as a guest of Alan Phillips, and believe it to be one of the finest courses I have ever played. My family background saw me brought up in Perthshire, but we always had an affinity for the Edinburgh and East Lothian areas. I went to Edinburgh University, graduating in 1980 and I lived and worked in Edinburgh until 1987. Alan is married to my cousin Pat. Although I live in New York currently, I intend to come home to Scotland on a relatively frequent basis, and eventually may retire to East Lothian. I recently joined both The Renaissance and Archerfield Links clubs, and having played North Berwick, decided I would like to apply for Membership of this wonderful course too. I have many friends and business colleagues in the United States and elsewhere I know who would also enjoy the experience of playing the course. I am currently a Member of the Bonnie Briar Country Club in New York, and both a Governor and former President of the Club. (www.bonniebriar.org). My handicap is 7.5, and I love the game of golf for the enjoyment of the game as well as the contacts I have been able to make all over the world. The West Links Course at North Berwick Golf Club is the world's third-oldest golf course -- only St. Andrews (Old) and Musselburgh (Old) are older. The course still plays over its original fairways and its original architect is unknown. Located along the Firth of Forth, the sea comes into play on six holes (! 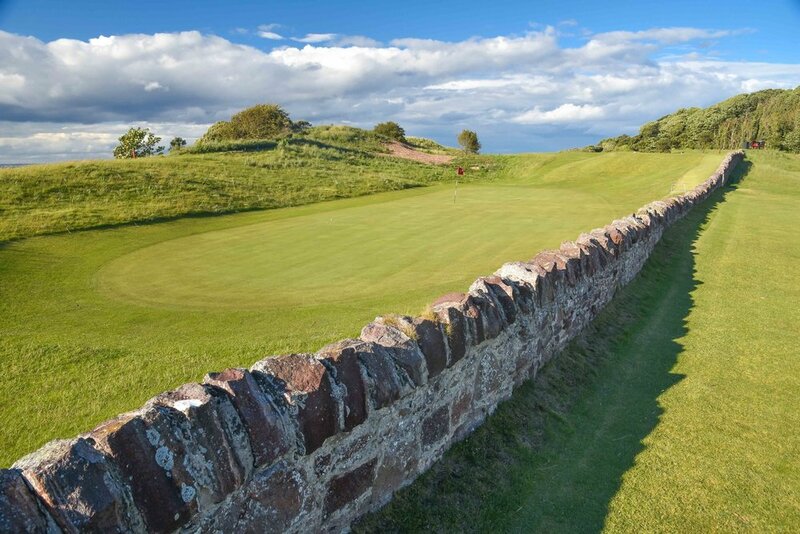 ), and the course begins and ends directly adjacent to the town of North Berwick. All 18 holes at the 6,500-yard track present unique design features that stimulate a golfer's creative juices. From rock walls that snake across and along several holes to huge swales that dissect greens, every shot is met with challenges that can be both fun and frustrating at once. Visitors aren't allowed to play the course from the tips, so the three single-digit handicappers I played with teed it up from the white tees, which measure 6,140 yards. That might seem short, but it was plenty difficult.